- How to go about it? 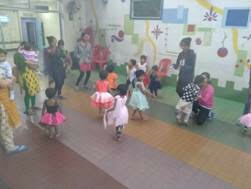 It was a fun filled afternoon for children on the 1st day of the year. 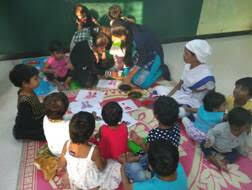 There were fun games , singing and dancing arranged for the children. 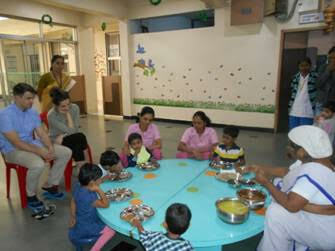 Children enjoyed with the volunteers and had a delicious lunch. New Year’s Day is a holiday in many countries. It was created to welcome the new year. In most countries, New Year Day is celebrated on 1 January.The new year is an event that happens when a culture celebrates the end of one year and the beginning of the next. Cultures that measure yearly calendars all have new year celebrations. 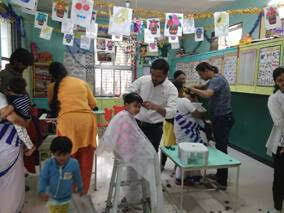 Hairdressers Rahul and Mandar arrange a fun filled and interactive haircut session at Shreevatsa every month. The festival of Bhogi and Makar Sankranti fall in mid January every year. 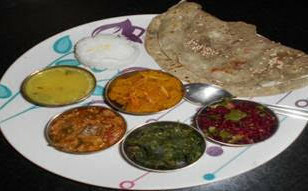 The traditional Bhogi curry and bhakari was made for lunch. Children were given the traditional sweets: ‘tilgul’. 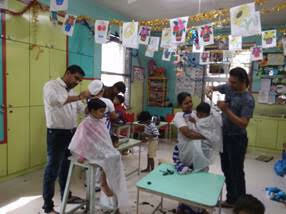 The children were told about the importance of this occasion. Bhogi is the first day of the four-day Makarsankranti festival. On Bhogi, people discard old and derelict things and concentrate on new things causing change or transformation.Bhogi is celebrated the day preceding and Makar Sankranti. Makara Sankranti is observed at the beginning of the Capricorn period under the sidereal zodiac, either 14 or 15 January, and signifies the arrival of warmer days. The festival is also dedicated to the sun god and marks the six months auspicious period for Hindus known as Uttaarayan. Makara Sankranti is believed to be a time for peace and prosperity. The day is regarded as important for spiritual practices and accordingly people take a holy dip in rivers, especially Ganga, Yamuna, Godavari, Krishna and Cauvery. The bathing is believed to wash away sins. Bor nahan is celebrated between Makar Sankranti and Rathasaptami in Maharashtra. 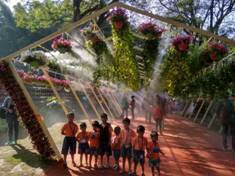 It is a joyous event of glorifying childhood by a shower of blessings and the small berry-like fruit – Bor. 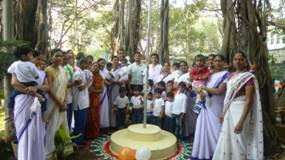 Children enjoyed the celebration and also ate the delicious berries and snacks. It literally means bathing the child with berries.Its a ritual celebrated during Makar Sankrant in January for children upto 5 years. Many people continue it for 5 years. Just like birthday celebrations other kids are invited, the child is dressed like Bal (little) Krishna sometimes with the jewellery made with sweets. 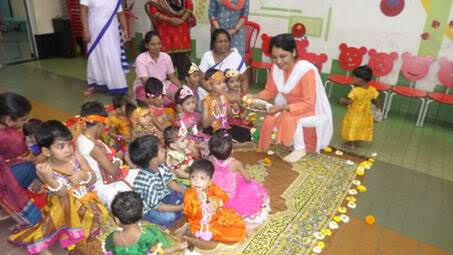 The child sits on a Chaurang in the middle and Aukshan is done followed by the ladies and other kids pouring berries (traditionally called Bor or Raibor in Marathi) over him/her. Samavedana NGO members who help SOFOSH in medical treatment were specially invited at Shreevatsa to unfurl the flag on the occasion of the Republic day. The Constitution was adopted by the Indian Constituent Assembly on 26 November 1949, and came into effect on 26 January 1950 with a democratic government system, completing the country’s transition towards becoming an independent republic. 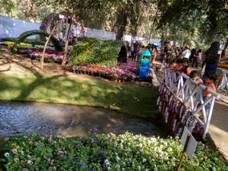 Children were taken to the Empress Garden to see the flower show.